Use our resources to learn more about the long history of Native American protest movements in the Dakotas. Teachers, scroll down for a quick list of key resources in our Teachers Toolkit, including today’s MapMaker Interactive map. Look for our newest updates in italics. These Native American protesters are not associated with the Dakota Access Pipeline protests of 2016—they are commemorating the Oglala Lakota occupation of Wounded Knee, South Dakota, in 1973. 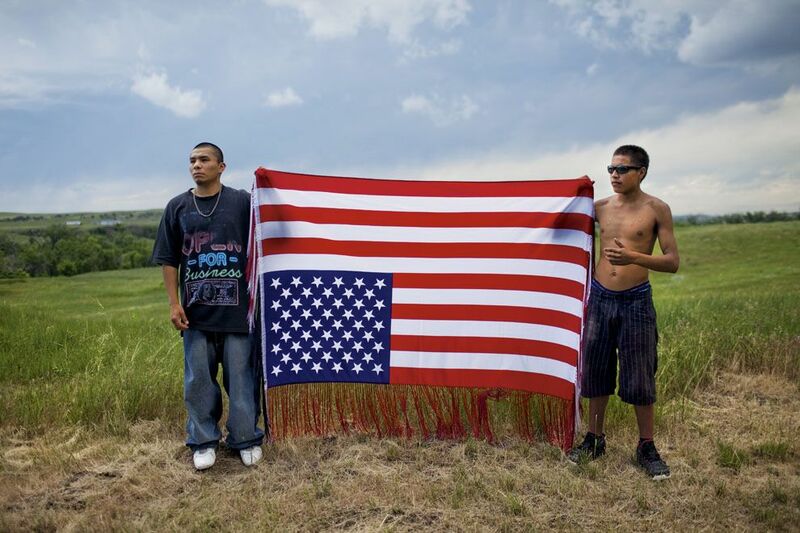 The upside-down American flag is a symbol of “dire distress” and has also been adopted by the pipeline protesters. The Dakota Access Pipeline would run from Stanley, North Dakota; through South Dakota and Iowa; and end in Patoka, Illinois. From Patoka oil could be transported through a pipeline to the Gulf Coast for storage, refinement, or export. The DAPL intersects with 22 bodies of water. Use today’s MapMaker Interactive map to see what rivers and creeks the pipeline must drill beneath. Remember: This is not a National Geographic map; this is an amateur map made with our National Geographic MapMaker Interactive tool. Please make your own map of the DAPL and share it with us! Get acquainted with some of the key places in the Dakota Access Pipeline dispute. Remember: This is not a National Geographic map; this is an amateur map made with our National Geographic MapMaker Interactive tool. Please make your own map of the DAPL and share it with us! Hundreds of people in North Dakota are protesting the Dakota Access Pipeline. What is the Dakota Access pipeline? Energy Transfer Partners has completed construction of the pipeline up to Lake Oahe, a reservoir created by a South Dakota dam on the Missouri River. But the company still lacks permission from the US Army Corps of Engineers (USACE) to perform the drilling there. The pipeline itself is about 30 inches in diameter and would be installed underground: 140-210 feet below the ground surface of federal lands and approximately 92 feet below the bottom of Lake Oahe. It would carry about 470,000 barrels of crude oil from the Bakken to Pakota, Illinois. From there, the oil could be transferred through an existing pipeline to facilities on the Gulf Coast, where Energy Transfer Partners has a refinery. The oil could also be transported by rail to facilities on the East Coast. The pipeline is estimated to cost $3.7 billion. Supporters say will result in $156 million in sales and income taxes, about 40 permanent jobs and thousands of temporary construction jobs. Protests are being led by tribes of North Dakota’s Standing Rock Sioux Reservation. They have filed an injunction against the USACE, which approved the pipeline, to halt construction. The protests began with a group of teenagers fighting the plague of suicides on the reservation. Fantastic read on how student activism launched a movement here. In addition to members of the Lakota and Dakota tribes of the Standing Rock reservation, members of more than 200 Native American tribes have joined the protests. Veterans have become a vital part of the protests. Hundreds of people have protested in Washington, D.C., and Texas, as well as North Dakota. Protests have moved from rural Morton County to North Dakota’s big cities of Mandan and Bismark, because protesters say police barricades have restricted access to construction sites. Why are people, especially Native American groups, protesting construction of the pipeline? The core protest group is called Rezpect Our Water. It is primarily concerned that installing the pipeline beneath the nearby Missouri River will impact the safety of the reservation’s water supply. The USACE released a statement of “no significant impact” in July 2016. The original route of the DAPL ran through Bismark, but was re-routed in part due to its feared impact on the North Dakota capital’s water supply. Critics say the U.S. Army Corps of Engineers did not go through the consultation process before approving the pipeline. The Corps and North Dakota lawmakers deny this, saying the Standing Rock tribe was consulted. Why wasn’t an environmental impact report conducted for the Dakota Access Pipeline? No federal agency has jurisdiction over oil pipelines. For this project, USACE has jurisdiction over a very small portion of the overall pipeline. Why have the protests been in the news all over the world? The conflict turned violent as protesters faced off with private security contractors hired by Energy Transfer Partners. (Watch the Democracy Now video above for footage of the initial altercation.) The violence has now extended to law enforcement personnel and private citizens. About 75 protesters were arrested after a “rogue” group set up a camp on private property. A young woman (a protester) was severely injured and may lose her arm as a result of an altercation between police and protesters. Police say she may have been injured by an explosive device detonated by protesters, while protesters say she was injured by a concussion grenade thrown by police. Police doused protesters with tear gas, rubber bullets, and water hoses in subfreezing temperatures. More than a dozen protesters were sent to the hospital, and police defended their actions as defending the bridge the protesters were trying to cross. The bridge blocks access to the pipeline construction site. Perhaps the most famous warrant was issued for journalist Amy Goodman, who was covering the protests for Democracy Now, above. Protesters say security personnel unleashed attack dogs and pepper spray against non-violent protesters, and law-enforcement personnel failed to protect the protesters. As large protests have moved from the rural pipeline area to North Dakota’s cities, government and law enforcement personnel have urged protesters not to pursue change through violent means. The increased police presence is very expensive. Energy Transfer Partners CEO Kelcy Warren has said publicly that he was interested in reimbursing North Dakota for law enforcement costs incurred. 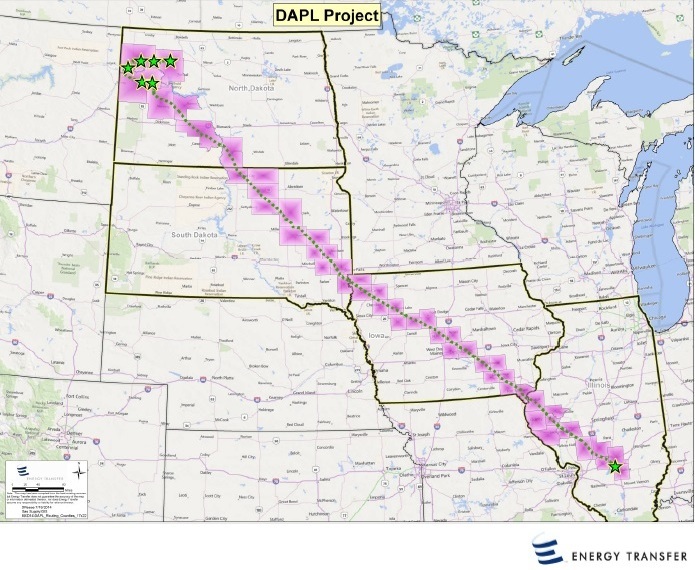 President Donald Trump has between $500,000 and $1 million invested in Energy Transfer Partners, and $500,000 to $1 million holding in Phillips 66, which will have a 25% stake in the DAPL once it is completed. Last month, a spokesman for President Trump said he sold all of his stock in June, but there is no way of verifying that sale, and President Trump has not provided documentation of it. The order does not mean construction on the pipeline will immediately proceed. “These initial steps do not mean the easement has been approved,” said Maj. Gen. Malcolm Frost, chief of public affairs for the U.S. Army. A status hearing is slated for a hearing in federal court on February 6. The judge is considering answers to two questions: 1) When will the Dept. of the Army have a decision on how to proceed given the memo; and 2) If the easement is granted, how long will it take DAPL to complete the pipeline? The USACE is preparing to close the main protest camp entirely. The site is on a flood plain; the Corps says record snowfall may cause flooding and put the protesters in danger. The USACE has conducted further review and called for “additional discussion and analysis.” Assistant secretary of the Army Jo-Ellen Darcy cited the history of “repeated dispossessions” of the Great Sioux Nation, and called for greater health and environmental considerations for the easement that would allow the DAPL to cross the Missouri. Energy Transfer Partners has filed suit against the USACE, seeking a decision that will allow construction to continue beneath Lake Oahe. The following is a list of pipeline accidents in the United States in the 21st century. It is one of … On January 21, a Chevron pipeline leaked from a welding flaw near Corinne, Utah, …. The failure was due to an ERW seam failure, with this particular pipeline having had other ERW seam failures in the past in 1987 and 1993.
why could the people of Bismark ND ask them to change the route but the native people can’t? The concern over the risks of a pipeline crossing the Missouri are highly inflated. Take a look at a national map of pipelines in the U.S. and see the major rivers crossed (https://www.npms.phmsa.dot.gov/Documents/NPMS_Pipelines_Map.pdf). There are literally thousands of such pipelines. These are the safest way to transport these products (remember the recent crashes of trains carrying oil?) Yes, there are occasional problems, but these are generally small and contained without widespread consequences. These pipelines allow the protestors to travel to ND driving their gas powered vehicles and to stay warm with propane heaters. The seem oblivious to the ironic spectacle they present. any planning for memorial day weekend ?? Could the Dakota access Pipeline be more beneficial or dangerous to the American people? After doing some research on the Dakota access Pipeline the only benefit I notice is the pipeline will create more jobs and increase revenue for a few states that the pipeline will be passing through. But it seems that there are more negative issues that will come with the Dakota pipeline then there is good. For instance the pipeline construction will increase pollution in the environment along the route of the pipeline harming crop, animal, and human life along with contaminating drinking water. Secondly there is a potential threat that a spill could occur which will damage the environment and harm wildlife, crop, drinking water and humans in the path of the spill. Overall I hope the pipeline is not built and that the company and the government who has the authority to stop it will notice that there are more negatives than positives that will come from this pipeline. When I was a kid, one of the things I loved about National Geographic were the maps. Could you include a topographic map also showing the reservations, the pipeline, land owned by the company, land leased by the company, springs or underground water sources, and culturally significant sites? Pingback: In Homeschool This Week… | I.D.E.A.S. National Geographic needs their fact checkers back. There is a threat to the water supply as proven many times by other indigenous people’s throughout the world; the Amazon for instance. Water is sacred. No, there is not a threat to the water supply. No one gets the water from that lake.